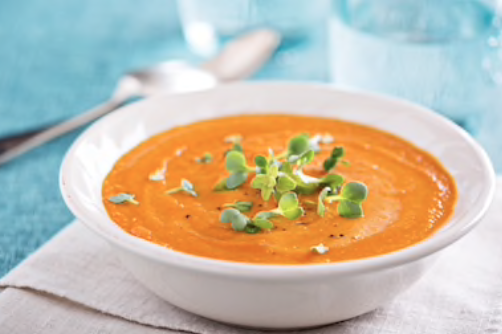 This soup furnishes you with a way to use up those leftover sweet potatoes hanging around in your fridge! 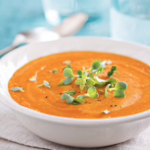 When combined with the smoky chipotle peppers and the rich maple syrup, this soup has gratifying and healthy written all over it. We only use real maple syrup in our test kitchen. Real maple syrup’s powerhouse combination of high levels of manganese and vitamin B2, as well as boasting the lowest glycemic index of any sweetner, make it a must in this appetizing soup. Place Sweet Potatoes, Onion and Garlic in 4 quart plus-size pot and cover with water. Bring to boil and reduce heat to medium. Cook until Potatoes are tender–about 20 minutes.